When describing lions on the Southern Building’s facade, the word “festooned” seems appropriate. 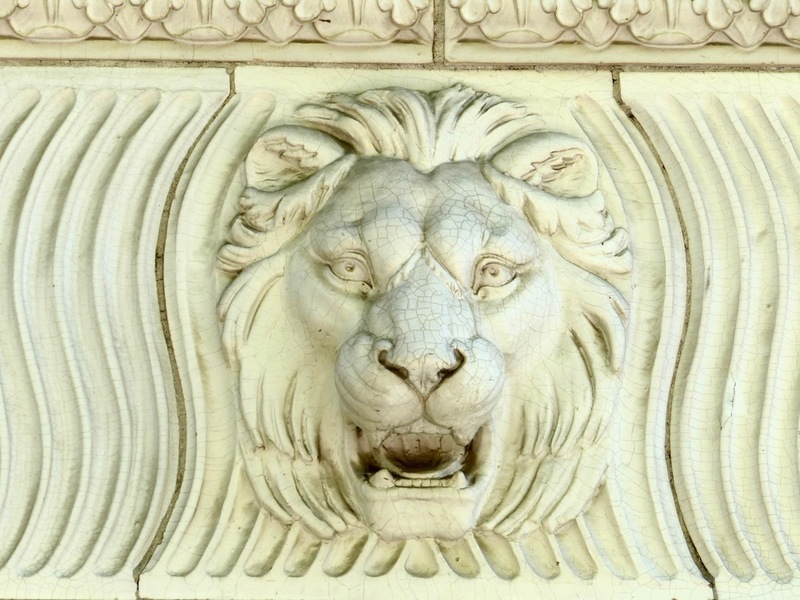 The Southern Building has 274 open-mouthed, male lion heads set in three different types of ornamentation. I have yet to find more lions depicted in any single piece of art or architecture in Washington, D.C. The vast majority of the lions are set below windows with circular ornamentation surrounding them. The next most common style occupies the first two floors of the building and uses the same lion head on a spare, wavy terra cotta tile field. The third, and least common, again appears to be the same lion head, but topping a shield over a column near the top of the building. 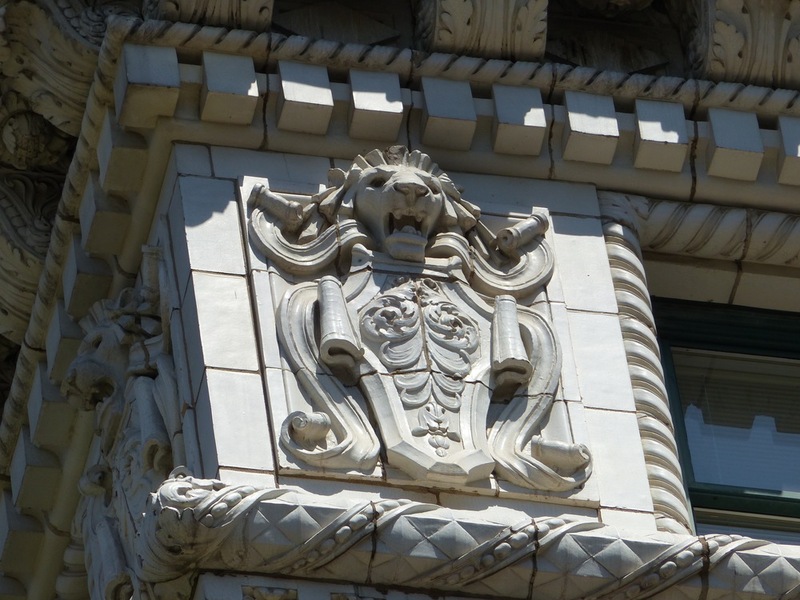 Lion heads are often depicted with natural elements or with ornamental frames, but I am drawn to the abstract wavy, pattern used on the lower floors of the Southern Building. It hints at a future architectural aesthetic that extends beyond the turn-of-the-century, Beaux Arts style of the building. The building receives minimal commentary in historical literature and is overshadowed by two major personalities involved in its design and ownership: architect Daniel Burnham, who looms large over architecture in the United States, and Robert Wynne, who advocated for his company, First National Fire Insurance, to take a 50% ownership stake in the building. While corinthian columns were probably Burnham’s most used architectural trope, he used lions in several other of his buildings, including the Flatiron building in New York City, the St. Louis County Courthouse in Duluth, Minnesota, and Columbus Circle in Washington, D.C. He also used decorative spandrels in several buildings, including the Pangasinan Provincial Capitol in the Philippines. However, the use of lions on this building did not appear to have any special meaning. By the time the Southern Building was drafted, it was late in Burnham’s career and he had large teams working on each building. Choices were sometimes driven by available components in catalogs. 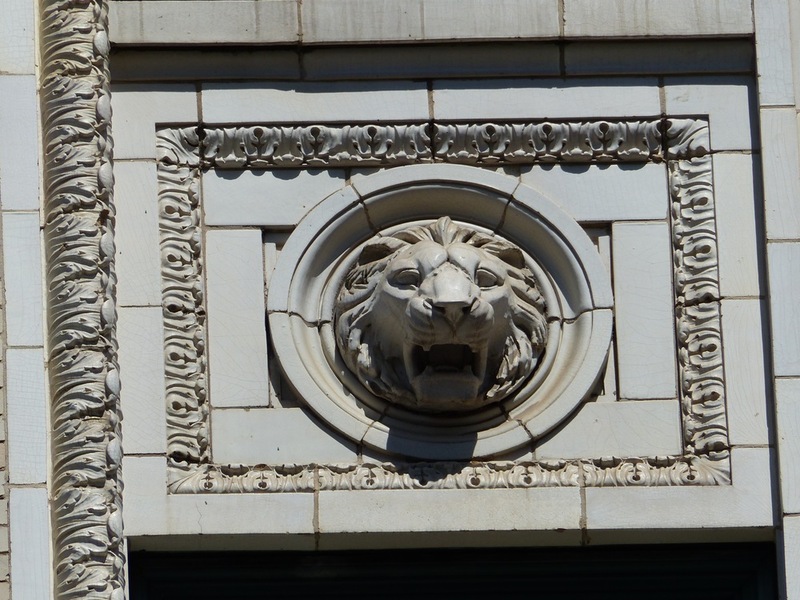 In this case, the lions on the Southern Building would have been the catalog of the Atlantic Terra Cotta Company. The Atlantic Terra Cotta Company was at one time the largest producer of terra cotta in the United States and had factories up and down the East Coast. They grew rapidly during the late 1800’s and early 1900’s through a series of acquisitions. The company produced features for the U.S. Supreme Court, the Flatiron Building, the Philadelphia Museum of Art, and the Bronx Zoo’s Lion House. By the 1920’s, Atlantic Terra Cotta claimed to have supplied materials for 40% of the terra cotta buildings in New York City and had product lines that covered nearly every style an architect could desire. A July 1916 Architectural Digest article describes a terra cotta model becomes very cheap to reproduce after it has been created. Perhaps the Southern Building was simply a case of getting their money’s worth by making 274 copies. Wynne was ousted as president in April 1914 only a few months before the congressional inquiry vindicated First National Fire’s investment in the Southern Building. What followed was, nearly seven years of legal wrangling included Wynne’s reinstatement, several changes of ownership for the building, and over 50 Washington Post articles documenting the drama as it played out. In August 1917 in an article titled, “Charges Malice Injured Business,” the Washington Post reported that Wynne petitioned the court to put the company into receivership. The valuation of the building in the eventual liquidation once again proved Wynne’s investment in the building had been a financially responsible decision. In the end, there is nothing that seems to tie lions to the building, the architects, the owners, or even the location. Even being located on the site of a former Saint Matthew’s Church seems to offer no clues, as the lion is a symbol of Saint Mark while Saint Matthew is traditionally represented with the figure of an angel. So until I take a trip to Texas to review the Atlantic Terra Cotta archives or to Chicago to review Daniel Burnham’s papers, it is likely to remain a mystery.